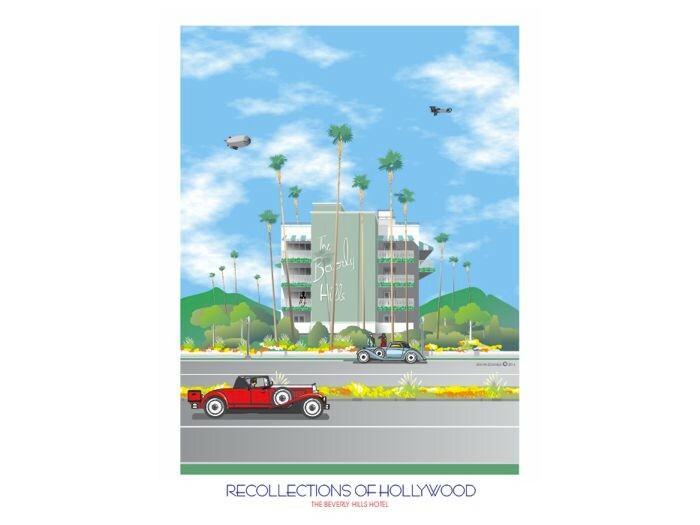 Digital Artist Jim Van Schaack has drawings of landmarks including Beverly Hills including the Beverly Hills Hotel and Gucci Beverly Hills. The Beverly Hills Hotel is located on Sunset Boulevard, just a few miles west of Hollywood. It was originally built in 1912 to attract people to Beverly Hills. Along with the main building were 21 secluded bungalows that set in 12 acres of landscaped gardens. This romantic hideaway became famous because movie stars including Clark Gable, Marilyn Monroe, Elizabeth Taylor, Richard Burton, Humphrey Bogart and friends hung out at the hotels popular Polo Lounge and Polo Grill, the places to see and be seen. The Beverly Hills Hotel for many years was the center of Hollywood business and social life. However, later the hotel fell on hard times until the recent $100 million dollar renovation. The legendary Beverly Hills Hotel with its cabanas, pool, Polo Lounge and Polo Grill are once more at the center of Hollywood deal-making, reviving the style of Hollywood’s hayday. 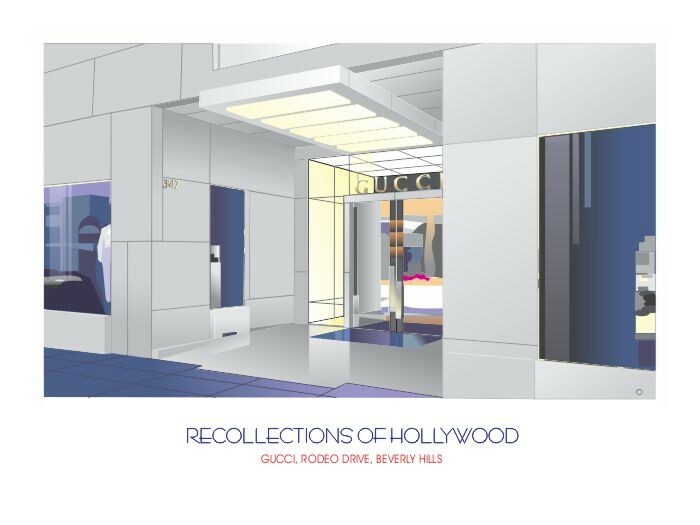 Gucci Beverly Hills, One of the worlds most famous manufacturers and retailers of high quality high fashion merchandise, located on a street in Beverly Hills like few others in the world, Rodeo Drive.